I feel like this was a great start to the year. I read six books! I even enjoyed most of them! I’m really hoping my reading stays like this for the rest of the year. Heck, I hope I read more books a month. I’m really making reading a big priority for me in 2019. 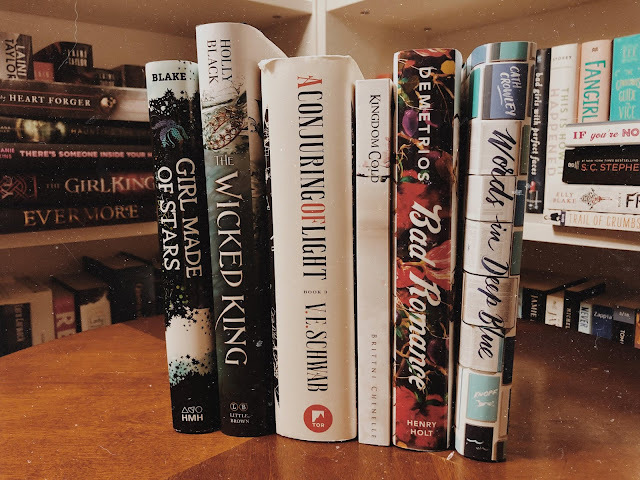 The Wicked King by Holly Black: Oh my, this book was just UGH. I cannot believe I have to wait another year to see what happens. I need it now!!!! Bad Romance by Heather Demetrios: This book was hard-hitting. It’s such an important book. There are a lot of trigger warnings for this book, please keep that in mind. Girl Made Of Stars by Ashley Herring Blake: This is another book that’s a hard-hitting book. I loved this book. It was my first book of the year and I’m glad I finally picked it up. Kingdom Cold by Brittni Chenelle: This book was a shock. I was asked by the author to review this book. This book had the best drama that I didn’t know I needed. It was like watching a TV drama unfold before my eyes! A Conjuring Of Light by V.E. Schwab: This was actually a 2.5 star rating. I’m really glad this series is over. I don’t think I’ll be picking up more books by Schwab in the future. I’m so disappointed that I didn’t like these books. I wanted to so bad. Words In Deep Blue by Cath Crowley: I really wanted to love this book. It was so poetic at time. I just wish that it was written in letter format! No two star ratings this month! No one star ratings this month!